← LOG#195. Quantum theory of photon spin states. Preface (by the webpage master administrator, Amarashiki): This is the first invited post here, at TSOR. It has been written by Alejandro Rivero, a bright non-standard theoretical physicist out there (you can follow him at https://twitter.com/arivero). It has some outstanding remarks on the (super)bootstrap, compositeness, supersymmetry (SUSY) and the Standard Model (SM), and it requires only knowledge on group theory and particle physics (the Standard Model, of course) to follow it. 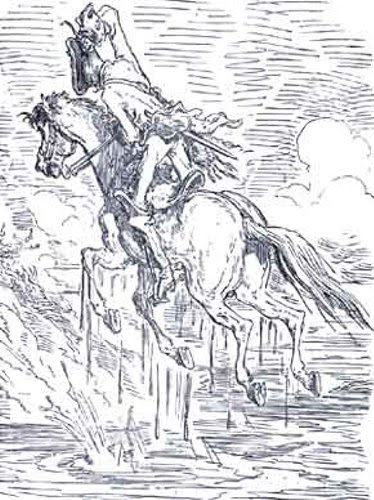 In the picture, Baron M. gets itself out of swampland by pulling from his own (and his horse) pigtail. Bootstrapping is the idea of fixing some of the parameters of a model by asking for consistency in some self-referencial way. It was popular in the sixties associated to the concept of “nuclear democracy”, that all the particles were equally elementary or composed of themselves, depending of the channel where the interaction happened. In some sense the theory raises itself by pulling from its own bootstraps. Supersymmetry (SUSY) is the idea of allowing a symmetry that transforms bosons to fermions and vice-versa; one of its consequences is that for each spin 1/2 particle the model must contain two scalars of the same charge. Such “superpartners” were expected in the LHC, but they have not appeared -yet?-, casting shadows of doubt about the usefulness of the idea. It was never hoped that the bootstrap could be able to fix the multiplicity and quantum numbers of the particles in a model; nowadays this task is partly done by another consistency requirement, anomaly cancellation. But it happens that when combining the ideas of self-reference and supersymmetry the selection of models reduces considerably. 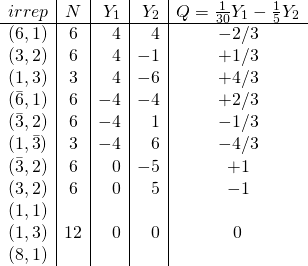 The table is interpreted as three generations of scalars with the correct electric charge; plus three “half-generations” of a object. It could be interesting to set also the Q of this extra (1,3) to zero, but in order to do this we would need to grant some baryon number to (6,1) and (3,2). This is possibly the most straightforward way to obtain three generations of standard model color and electric charge out of a string motivated group. I have never seen it quoted in the literature, but I have never been very conversant with string literature. From GUT point of view, this also left unnoticed because one wants to get also the chiral charge, and then one looks for spinors in complex representations by exploring groups , which excludes . Isolated, 15+15+24 can be considered as a 54 of or a 55 in or . To propose an identification for the components of the of we can also branch the 10-plet of the SO(10) group first to , with and then to , via . We see that the 10-plet has three elements with , two elements with and then the corresponding opposite charges. Abusing a bit on traditional notation -or perhaps not!-, we can call to the elements of the triplet and to the doublet. It can be said that the bosons are actually being generated from pairing “quarks” or “antiquarks”. 2. The view from below. and so . Plus, we can ask to be even, to make sure we build a pair number of scalars of each charge (we want to be able to promote them to a supersymmetric theory in the future). and then . This in turns implies that one generation is composed of Dirac-like tuples -including the neutrino-, plus one extra state, with its antiparticle. This extra state can be either neutral or charged with +4/3. Now, we can try to add colour and in this path we scale up the group size. We notice that a full representation of would have a size and then we suspect we can get the needed representations by breaking some group of about this number of components. Immediate candidates are and . We have got a good match to the non-chiral quantum numbers of the standard model using the former, it is work in progress to see if using the later we get some match to the chiral numbers. A peculiar thing is that the bosons of this theory appear in equal number that the different kind of mesons known in the experimental spectroscopy. This is, of course, because the top quark does not hadronize. On the other hand, the diquarks here are not the “good quarks” but the bad ones; they have been paired with the adequate colour during the branching. An interesting idea is that we are actually seen, as mesons and diquarks, the remmants of the scalars of the supersymmetric standard model. Remmants or hidden, what we are telling is that the scalars are composites of the quarks. So we have a theory of preons, but without preons. But of course, we could ask what is the result of applying the SUSY transformation operator to such scalars. Is it a composite fermion? I do not know, but if it is, it is a composite containing quarks. The standard model particles bootstrap, themselves, as composites of themselves.